Thousands of cheering fans turned out to the Auckland, New Zealand airport yesterday to cheer on their Rugby World Cup-winning team the All Blacks. Amidst the cheers and signs, the Air New Zealand ground crew performed a traditional Maori Haka dance to welcome the team back home. According to the Guardian, the final was claimed to be one of the best victories ever, as the New Zealand All Blacks was victorious against Australia with a final score of 34-17. 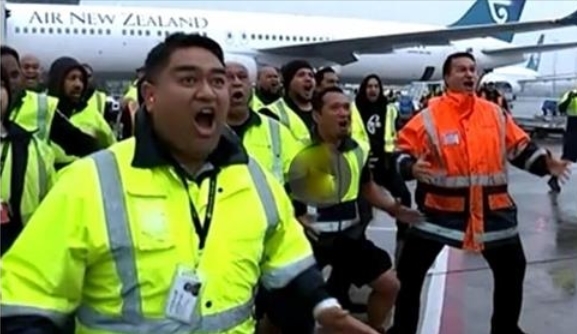 Responses to "Air New Zealand Crew Perform Maori Haka Dance for Rugby World Cup Champs"